Townend : A Quiet Jewel. East of Windermere is an historical treasure that we have a special interest in – for it was built around about the same time as Sykehouse Cottage. It’s attached to no famous name and therefore doesn’t attract the crowds – like that other farm on the west of the Lake, Hill Top, does – but for a delightful insight into 400 years of Lakeland life, Townsend is perfect. The Browne family was an ordinary farming family but their home at Troutbeck is a beautiful evocation of a past life and well worth a detour to visit. The place is crammed full of quirky household objects from c17th onwards. There are excellent, informative guided tours and often they put on an afternoon of cooking where they recreate some of the recipes from the Brownes’ family recipe books. 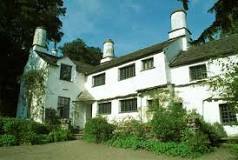 Townend is a National Trust property and is open from March to October. It’s about 20 miles from the Cottage and for further details on opening times and prices, follow this link. Categories: Lake District Crafts, Local History, National Trust, Things To Do, Uncategorized | Tags: local attractions, local history, National Trust | Permalink.